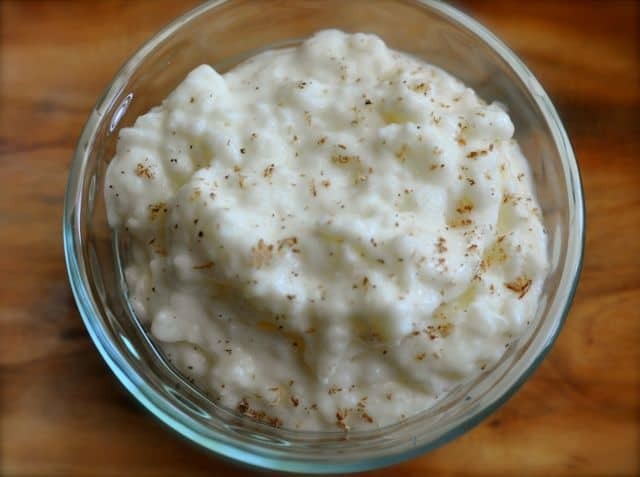 Home » Copycat Restaurant Recipes » Kozy Shack Rice Pudding – you can make this at home. Kozy Shack Rice Pudding – you can make this at home. Kozy Shack Rice Pudding is a creamy and sweet rice pudding that is easy to make. Kozy Shack Rice Pudding has been a long requested recipe that we are pleased to offer. We suggest using water polished rice if you have it available because it gives the rice a better texture when you make the Kozy Shack Rice Pudding. This copycat Kozy Shack Rice Pudding contains gluten, this recipe tastes like Kozy Shack Rice Pudding. Place sugar, flour, salt, and milk in sauce pan. Stir on medium low heat until mixture begins to boil. Let boil while stirring constantly for 2 - 3 minutes. Remove from heat and place 1/2 cup of hot mixture into egg yolk and mix well. Pour egg yolk and rice into hot pudding mixture and place back on stove, continue to cook for 2 - 3 minutes. Stir constantly so pudding does not lform lumps and stick to the bottom of pan. Remove from heat, add vanilla and blend well. Chill before serving. Add your favorite garnish. Fruit, whipped topping or a little cinnamon or freshly grated nutmeg is nice. I strained a heaping tsp of the real Kozy Shack pudding. It had some long grain and the majority of it was chopped up. It only has a slight yellow color in it which I assume is the natural flavor-vanilla, but could possibly be a bit of yolk. To me it taste like it has beaten egg whites in it to thicken it along with cooking the milk until it reduces which is what thickens it, not flour. btw, I believe polished rice is just white rice, which has the brown husk removed. Some people don’t know what polished rice is. There is option on this site to delete or edit or I would have put all my comments into one. The reason this can not be copy cat is because they use 2% Reduced fat milk, I believe the rice is a short grain, not so much sugar per serving and they use very little eggs, salt and you don’t even know what the natural flavor is, it can come from plant, yeast or animal extract, but is obviously a secret to the taste of it, so that no one can really copy it. Cozy shack does not have flour in it. There is 8 servings for this recipe, so at the least 1 tsp per serving that would be less then a 1/4 cup. 2 tsps per serving would be 1/3 cup, so think about it that way before you make it. I’ve made rice pudding with coconut milk, which is also good. Dur, there is no flour in the “ingredients” on Kozy Shack pudding. Thank you for your comments of my recipe. I do appreciate it. I will roll all of your comments into one. Diane you obviously know more about cooking than any of us could possibly learn in a lifetime. You should put your recipes on the internet. I’m sure everyone will agree we want to do everything perfectly just like you do. I eat a whole package of the Kozy Shack in one sitting. The cups seem to be a little smaller than a cup of Jello items. I love this stuff,, so I was so excited to find your recipe. My husband never eats the Kozy Shack Rice Pudding that I buy at the store, he always sticks with Chocolate pudding. I fixed your recipe the other night. I bake and make sweet desserts all the time. Your recipe is fantastic!! I have made other rice pudding recipes, and never was very pleased with the outcome. The recipe is so easy, and easy to follow, so I’m not understanding the negative comments. As far as the comment about the color her pudding came out, well for one thing, some yolks are darker than other ones, I’m not sure if the older the yolks are, the darker the yolks are, and sometimes when I buy large eggs, I actually think they are medium, so in that case, if you really get a so called large egg,, then the yolks will be bigger, making the color darker, but I don’t see where that’s a big deal at all. Like I said, your recipe is fantastic!!! The pudding I made turned out excellent! It was just as delicious as the packaged Rice Pudding by kozy Shack. My husband also loved it and asked for me to make it again. I think I’m going to make some right now. Thank you so much for sharing! It’s delicious!! Hello! In the picture the rice pudding is white, but mine came out a little yellow because of the egg yolks. Did I accidentally do something wrong? Like maybe miss a step? Thank you! The Kozy recipe does not use that may yolks. The package even says less than 2% of eggs were used. Wish I would’ve read the comments before making this. Not happy with it. Nothing like Kozy Shack at all. Extremly disappointed in the results ???????? I just made a quadruple batch for Thanksgiving…my first time ever making it. U read the reviews after and the rude comments infuriated me, they should be grateful you put the effort in to recreate this recipe which I find VERY similar. I added cinnamon and all spice and I find it very similar the the Kozy Shack custard rice pudding the stores used to carry. Thank you Stephanie I will look for your cookbook. Read the recipe again. You’ll see when to add rice. False. Also is it cooked rice or raw? You people are idiots, read the recipe! Would it be ok to use minute maid rice bcus i cant find long grain rice anywhere? Also im very confused about a few things, should i cook the rice separately or do like the recipe states n remove from heat and place 1/2 cup of hot mixture into egg yolk and mix well. Pour egg yolk and rice into hot pudding mixture and place back on stove, continue to cook for 2 – 3 minutes. Is that long enough to cook the rice thoroughly or like i asked does the rice need to be cooked separately then added? I did use Minute Rice, because it is what I had at the time. It came out really good. Would love to make this bcus I’ve been eating Just kozyshack rice pudding n thats it all day everyday for weeks. Where im confused is with the eggs? Everyone is saying use beaten egg yolks, so when do i put them in and when do i put the whites in and what do i do to the egg whites. Im looking for a pudding like texture?? Please help, im starting to get hungry. ive bought out 3 of my local grocery stores n none of them will be getting another shipment for 2 days so ill starve to death.. I really wanted to like this because Kozy Shack my husbands favorite, but it was truly terrible. It was sickly sweet, had an odd flavor, and just not at all like Kozy Shack. It doesn’t even look the same. This shouldn’t be called a copy cat recipe. Wanted to make rice pudding for my husband since we don’t have money right now. But he can’t have gluten. Anything besides flour I could use? Cornstarch? I have been eat this every day all day for 3 weeks now. I’m so addicted. The price is great and I have a Wal-Mart at booth ends of my street. Was surprised to find out Heritage Dairy store has been putting it in their clear plastic containers and up the price and selling it as the brain. Wow when 1 of the workers told me i stopped buying it from them. I looked for coupons and couldn’t find any. With coupon I can buy more. I’m soon addicted. Way too thick and sweet. Not at all the creamy simple and delicious flavor of Kozy Shack. Thanks for sharing the recipe though. Thank you for your comments. To make the pudding less thick, you can add a little more milk. The thickener may be from the flour. I don’t believe flour is listed in the Kozy Shack ingredient list.